Crown Jewel was the best mattress! I had the good fortune to stumble across a good deal on a Sealy Posturepedic Crown Jewel 19 years ago...yes 19 years ago! I can't begin to explain how comfortable that bed was, I miss it every night. It was the perfect blend of firm but cushy. My kids always wanted to sleep on my bed, because it was so comfy. My mom came for a visit and wanted to sleep on my bed, because it was so comfy. My ex tried to take the bed, because it was so comfy. Finally, this last year it was starting to sag a little :( so i made the decision to get a new mattress. The mattress store salesman talked me into a different brand and I've been sorry ever since. I'm going to return this one and get another Sealy and can only hope to get as lucky as I got last time. I probably won't ever keep another mattress for 19 years but if it's as comfortable as my last, I might! Worst mattress I've ever owned. Wrecked our backs. Never again buy a Sealy. Completely dead mattress after less than a year. This was not a cheap mattress and came with a 10 year warranty which was doubled by purchasing a specified mattress pad from the store. It came with a 4 month return policy. About 4 months and 1 week after purchase, the nice firm mattress lost its support totally on one side and the other side wasn't very good anymore either. It had been turned properly and had middle support. Since the mattress doesn't have a permanent 1.5" dip in the middle when not being used, the company does not consider it failed even though it's nothing like what I bought. I purchased one of these as an extra mattress for a guest house for someone that would be staying for an extended period of time. 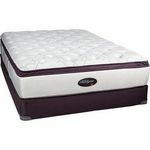 When I initially bought it, I wasn't crazy about getting one because I did own one previously and was extremely unsatisfied with the feel of the mattress, the firmness, and durability. However since it wasn't going to be permanent and it was just for a guest room, the price was low enough to make me willing to buy it. Really my husband talked me into it. It wasn't a surprise when my guest after about five months was trying not to complain, but I had asked how everything was and they told me they didn't know if it was how they were sleeping, but the bed seemed to be sinking in the middle slightly. I went in to look at it and sure enough not only was it sinking in way before there should have even been an indent, but when I laid on it, I literally felt a spring sticking my feet. I went onto sealy reviews and not surprisingly there were more than I can count of people complaining and with the company writing back not all sealy mattresses with inner springs are expected to last as long. I was disgusted and annoyed to say the least and I had a long drawn out battle with getting a new mattress and having them refund me fully and a free pick up to retrieve the mattress. I felt betrayed because they promote these mattresses without telling you the downside of how long it lasts and what it actually feels like to lay on a hard bed with springs. Or talk about how any time you turn over you have to listen to squeaking from the springs. Never again! I purchased a sealy bed thinking it was going to be like the one my parents gave me. Little did I know how wrong I was. The bed was extremely comfortable when I first bought it. I was happy to have such a nice bed. Now, not even a year later the support beam in the box spring broke. It was made with a piece of wood that had a huge knot in it. I can't even get it fixed with the warranty because of the cost to transport it to be fixed is too much. The bed that once helped my back now does nothing but make it worse. The futon in my living room feels better now. I'm very unhappy with my purchase. Next time I'm just going to buy a cheap mattress so when it breaks I won't be as upset with how much it cost me. 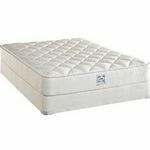 The Sealy Posturepedic Mattress is a winner! After using my husband's childhood mattress for twenty years, we decided to take the plunge and purchase a Sealy Posturepedic Mattress and I'm glad we did. This mattress suits both my husband who likes a very firm mattress and me who enjoys a little more softer model. 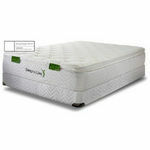 This mattress is extremely comfortable and yet provides a lot of support as well. We tried several of the memory foam mattresses while on vacations at different hotels, and I don't like how they retain body heat and make sleeping cool and comfortably nearly impossible. 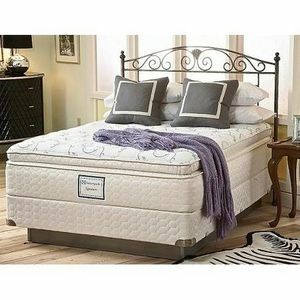 This model is a traditional mattress that is reasonably priced and so far has retained it's shape for us the past year. 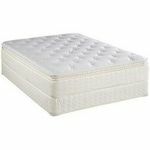 I would recommend The Sealy Posturepedic Mattress to anyone looking for a great budget conscious sleep alternative! My husband had this mattress when we moved in together and we haven't been able to afford a new one yet. It is decent, but can be uncomfortable after sleeping on it for awhile. We both end up tossing and turning a lot throughout the night until we find more comfortable positions. It seems that after awhile the mattress sinks in where you sleep. It's always more plush in the middle, so we end up congregating there in the middle of the night since the ends of the mattress are so uncomfortable. I wouldn't buy this mattress again, but it works for now until we can afford something better. When me and my husband purchased this mattress, we were elated because we thought that we had gotten a good deal on the mattress because of the name - Sealy - and the fact that the store we bought it from was closing, so it was at a discounted price. The mattress was unbelievably comfortable for the first few months, I'd say about the first seven or eight months, but then it just started to sag and make a lot of noise whenever we sat on it, laid on it, turned at night, etc. Additionally, it is very difficult to clean. When I tried to clean it with soapy water, it stained the mattress. Then, I tried bleach and that made it even worse! My husband and I couldn't return it to the stores because the store was already closed, and since we had gotten such a good deal for it, we just left it alone and decided to go with a brand other than Sealy. Comfort Comfortable for 7-8 months. Good mattress, great price. It is soft but supportive. Has qualities of a memory foam, like non bouncy. Has qualities of box spring, like support. Would buy this again if given the chance. Bought it at a closeout department store for a great price. Would recommend this to anyone needing a new mattress.